I was excited to see NGC 4038 and 4039, the Antenna Galaxies, come into view. And armed with a better understanding of the MINALT, I was keen to see the result. Not to mention seeing another RASC Finest NGC entry. The BGO 'bot recorded data from the duel intertwined galaxies in Corvus. 4038 is the northern galaxy; 4039 is the south. The RASC Observer's Handbook notes these two as a single entry. 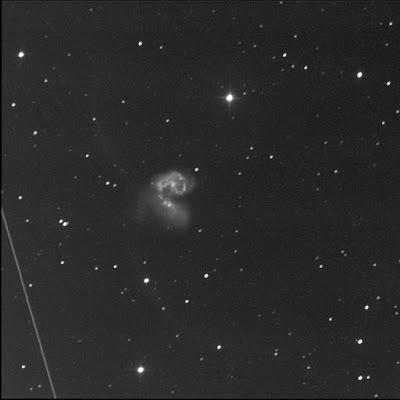 The antenna proper are hard to see in my image, just faint wisps arcing up and down, or north and south, along the east (left) side of the two galaxies. The galaxies themselves, together known as Arp 244 and Caldwell 60, are surprisingly bright. Must be all the star-forming activity due to the crazy gravitational forces. This target is also on the Herschel 400 list. Tried shooting again on 26 Jan '18 but the result was soft.